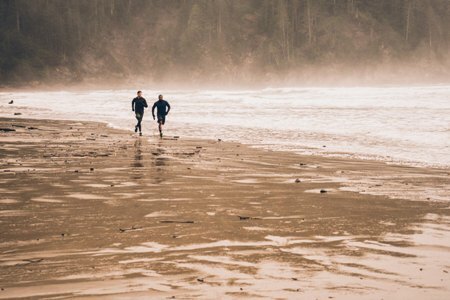 Running on the beach requires 1.6 times more energy than running on a hard surface does, according to St. Luke’s University Clinics in Belgium. As a result, you can expect to burn 30% more calories. And, while that’s a big enough reason to ditch the local park in favor of golden sand, running on the beach provides multiple other benefits, too. With the Centers for Disease Control and Prevention finding that 69% of 18 to 24-year-olds fail to complete 150 minutes of moderate physical activity per week, hitting the beach with your fitness gear in tow should be all the motivation you need to get fit and shape up. One of the greatest benefits of running on the beach is that it can be done at any time of the day and on any beach. According to the Insurance Information Institute, 60.2 million dogs are owned by Americans, therefore finding a dog-friendly beach to enjoy a run with your furry friend is the ideal way for you both to get fit together. Pooches are allowed on various beaches around the world. Therefore, if you’re looking for a sandy location to exercise with your hound ensure you do a search for dog-friendly beaches in your area. Some beaches allow dogs access all year round, whereas others have restrictions in place such as Rosie’s Dog Beach, Long Beach, California which allows dogs between the hours of 6 am and 8 pm only. Running on concrete, grass and similar surfaces puts undue pressure on your joints. As a result, it’s common for runners to experience injuries, including patellofemoral pain syndrome (runner’s knee), Achilles tendonitis and shin splints. However, by opting to run on sand, there will be less stress on your joints and the risk of injury declines. The European Journal of Sport Science’s ‘Sand training: Exercise-induced muscle damage and inflammatory responses to matched-intensity exercise’ study backs this theory up. Following the study, the researchers concluded that running on softer surfaces such as sand reduces muscle damage. It might look gentle and soft, but running in sand pushes the muscles in your body to the max. It takes much more strength to run in the sand than it does on solid surfaces. Therefore, your body works harder. In turn, your quads, glutes, and calves will all benefit from a better work out. It’s this extra work which helps to boost the number of calories lost during each training session. To further maximize the number of calories burned, run with weighted gloves or dumbbells. Although, experts recommend that the weight shouldn’t be greater than 3lb. Running on the beach provides runners with a beautiful scenic workout space which should be all the motivation one needs to get outdoors. However, one of the real benefits from pounding the sand is being able to do it at any time of the day, anywhere in the world. Furthermore, running on the beach is much kinder to your joints and provides a greater muscular workout than running anywhere else does.